We've been hearing about 'bucket lists' for ages now. You see blog posts, FB posts, hell... even movies about all of the things people want to do before they kick the bucket. Personally, I have never had one. I guess in a way I have things I want to do but never really thought about putting it down on a list... or lumping everything together to make a list. Add me to the long list of people with lists. I think it's coming up now due to my husband and I having long talks all the time about what all we want to do in the future. Shows that we watch, articles that we read... a lot of that stuff makes us sit and talk for hours about all that is out there for us to do before we die. So, here's my bucket list. I'll add to it over time, I'm sure. I will mark things off over time, I'm positive. 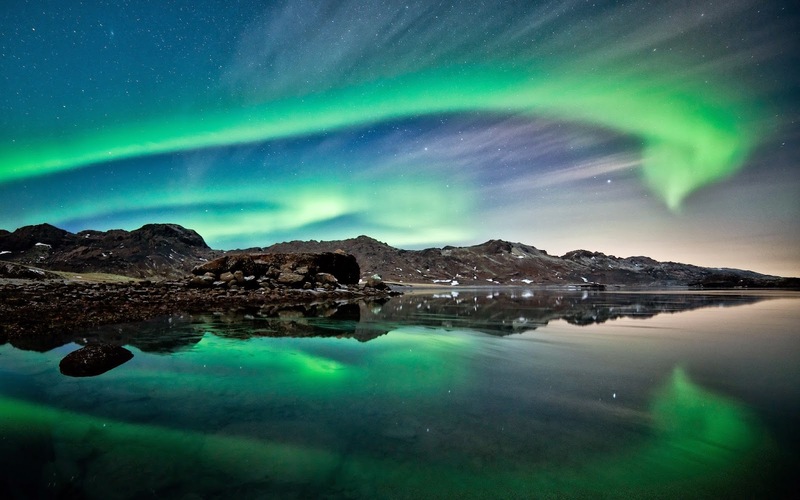 1) See the Aurora Borealis in person. Not in photos. Not in a video. I want to stand in Alaska, look up at the sky, and have my jaw drop and my mind be blown. People that have experienced the lights in the sky in person say it's an experience that you'll never forget. The lights dance across the sky and make you realize that there is so much going on in the sky and beyond. Yes, most of it still exists. It's a huge part of American History and they say the drive and the places you encounter along the way are fantastic and memorable. The route starts in Chicago and ends in LA, or in reverse depending on where you start. 3) Hire a genealogist to finally trace my family roots. I have traced my family as far as I can go on my own. With my mother's side of the family, I can trace her mother's side to right about they time they came into the country from Scotland, Ireland, and England. Her father's side? Not so much. I cannot find anything to beyond his name. My father's side is just as perplexing. I can trace my grandfather's family for a few generations but then got totally stuck. My grandmother on that side? Nope. Cannot move beyond her. I want to know about my ancestry and where they all came from. 4) After tracing my family to their countries of origin, I want to visit those places. 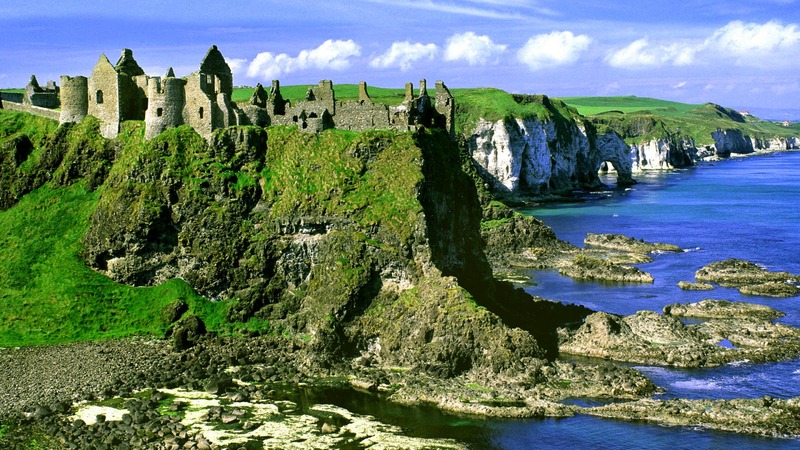 I'm certain that on my mom's side (her mother's side), the family came from parts of Ireland and Scotland. I would LOVE to go there and see where my family came from. 5) Visit all 50 states. I do believe that I am over halfway there. For future reference for myself, I'll list them here and update the list as I can. Alabama, Arizona, Colorado, Florida, Georgia, Illinois, Indiana, Iowa, Kansas, Kentucky, Louisiana, Massachusetts, Michigan, Minnesota, Mississippi, Missouri, Nebraska, Nevada, New Jersey, New York, North Carolina, Ohio, South Carolina, Tennessee, Texas, Utah, Washington, Wisconsin. That's 28 total. Only 22 more to go to get all 50 visited. 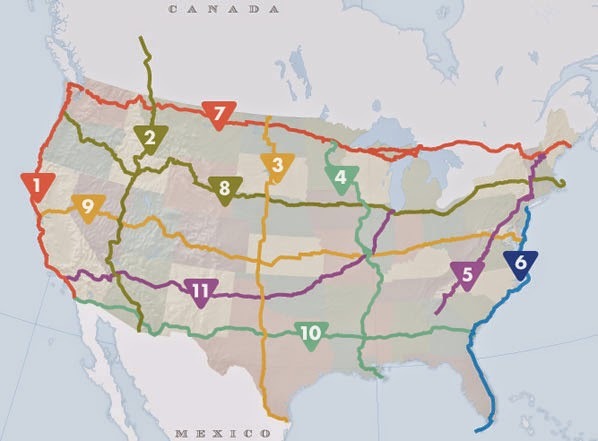 6) Drive all of the routes listed on Road Trip USA. Go take a look at the routes. If we take a family trip once a year and drives these routes, my kids will be able to say they have been to all 48 contiguous states. Hell, they already have quite a few under their belts due to the fact that we prefer to drive instead of fly. You just cannot see the country the same way from sitting thousands of miles above it in a plane looking out of a tiny window. I am positive that we will see all sorts of interesting and memorable things making these trips. Only when driving through the states do you realize there is an authentic Danish windmill in Elk Horn, Iowa. Yeah, we've been there. We saw a sign for it and decided to check it out. You cannot do that on a plane. 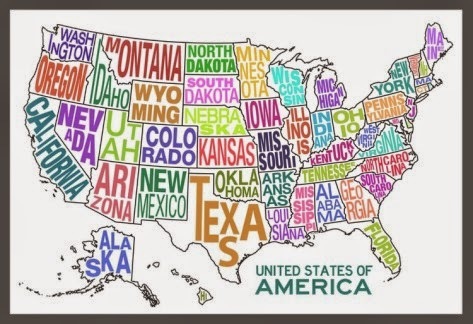 I figure getting the 50 states down first makes more sense and might be easier since most of the states connect to one another. I do think you should explore the country you live in as much as possible before exploring others. But that's me. As I stated above, I'm sure this list will grow. And I am certain that over time, things will be marked off. It seems that the majority of my list involves traveling. I don't like being in one place too long. I get tired of staring at the same walls, the same scenery all of the time. How about it? Do you have a list? Did you miss part 1? No worries... you can read it here. Okay, now that you've caught up, here are a few more shows that I cannot live without and I think you SHOULD be watching. If you haven't heard of this show, I'm so sorry. It's a great one. Yes, it's going into Season 6 but you can catch up! That's what the internet is for, right? 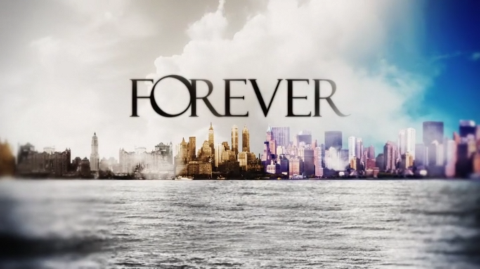 This show is about Detective Jane Rizzoli (Angie Harmon) and Medical Examiner Maura Isles (Sasha Alexander). They solve crimes and are BFF's although they are so different. Jane was raised with 2 brothers in the streets of Boston and LOVES baseball. Maura is like a walking encyclopedia... smart as hell but not totally socially ignorant like Brennan on Bones. The writing is great... so many great lines. And these ladies are gorgeous. And I've been in love with Angie Harmon's voice for YEARS. I will admit with pride.... I grew up wishing I had a treehouse. And back then, I was just picturing a few planks of wood in a tree. When I found this show, my jaw hit the floor and my inner child went WILD thinking about playing in these kinds of treehouses. These are literally little houses, in trees. Kitchens, bathrooms, bedrooms.... my dream! Makes me wish we had trees around our house. 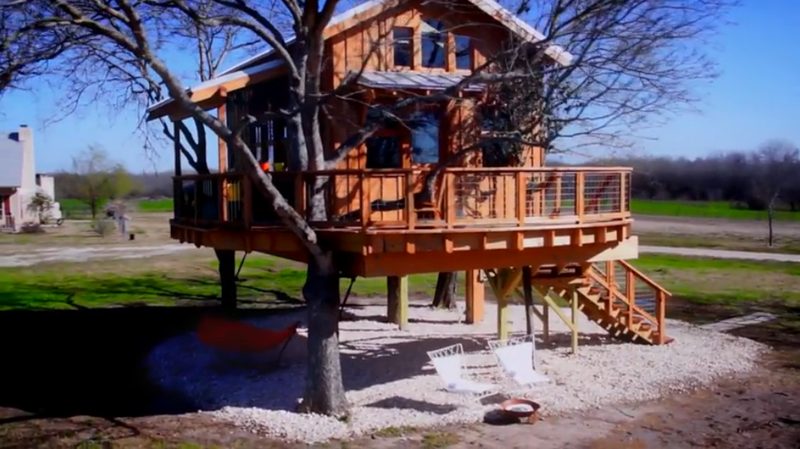 Pete Nelson is the Treehouse Man. He is a happy, giddy, crazy sort of guy that you can tell LOVES his work. He runs a bed and breakfast with his wife in Washington (weddings allowed, no kids) and all of the rooms are in the TREES! He has a team of builders that roam the country with him making dreams come true for people with budgets large enough to put a house in the trees. The crew is entertaining and the treehouses are really awe-inspiring. Meet Doctor Henry Morgan, the star Medical Examiner in NYC. Henry is not like other doctors of death. He's immortal... no not a vampire. Over 200 years ago, he died and then came back. He doesn't age but has to watch everyone in his life die over time. By trying to understand his immortal curse, he has learned more about death than most doctors could hope to learn in a normal lifetime. Henry partners up with Detective Jo Martinez, who does NOT know his secret. He reminds me of a British Patrick Jane from The Mentalist. I love this opening title graphic. I pointed out to my husband that I think it shows NYC throughout the last 200 years... every century Henry has ended up in New York. I could be wrong but look at it... on the left, low buildings and plain.... it changes as you look to the right. Neat. That's it for today, folks. I hope you at least give a few of these shows a chance. I've written a little in the past about my favorite shows. If you'd like to read it, click here. Some shows are still on that list and some won't be talked about anymore because they aren't ON ANYMORE. Yes, I'm bitter. Just a bit. Let's start off with a newer show on USA Network, because I need to give you enough time to watch the NEW SEASON this Tuesday, January 27th! If you don't like vulgar jokes and swear words, skip this first show, mmkay? My husband and I saw previews for this last year and it looked decently funny. We set the DVR to record and when we watched it, we were dying. See, it's vulgar. But it's smart vulgar. Hell, it's spurred by none other than Dennis Leary. It's on later at night so they allow some hellacious swear words, which I don't have an issue with at all. Some of the topics on the show may make some pearl clutching ladies blush but I love it. I am so in love with this show! Jonny Lee Miller does a hell of a job bringing Sherlock Holmes into modern day. And even though for years I was not a fan or hater of Lucy Lui, I am loving her as Watson. The show is smart, brings in characters from the Sherlock Holmes stories, and it's got a catchy little tune for an intro. Warning!!! If you are against killing animals for food/survival, don't watch the show. I stumbled upon the show one night in a hotel room in Paducah, KY on a trip to TN. The Kilcher family lives on a homestead in Alaska. There are 4 generations living on this homestead now and the shows follows them throughout spring, summer, and fall and captures the hell they go through to procure enough meat, veggies, and everything else they need to survive 8-9 long months of Alaskan winters. In the 1930's, Yule Kilcher and his wife moved to Alaska from Switzerland. They carved out a homestead and proceeded to raise a family. They had 8 children, 2 of whom are a feature on the show. The two main people featured on the show are Atz and Otto Kilcher, sons of Yule and Ruth. Atz's 3 sons (Shane, Atz Lee, and Nikkos) are now on the show on any given night. Atz Lee's wife Jane, Shane's wife Kelli, and Atz's wife Bonnie are also featured and you see what it's like living on the homestead from a female perspective. From a previous marriage, Otto's son Eivin is also on the show along with his wife Eve. They now have a baby and he is PRECIOUS. I have learned more about Alaska and what it must have been like living in the Pioneer Days from watching this show. It's great. I would love to have the will and get up and go to live that life. Even though they bust their asses procuring food and supplies each year, they have a far more laid back life. I didn't know until after watching it, but there is a member of the Kilcher family that EVERYONE reading this has seen and heard before and you probably don't make the association. Jewel? Sweet little, yodeling Jewel? Yeah. She's the only daughter of Atz Kilcher, sister to Shane, Atz Lee and Nikkos, and niece to Otto. Don't believe that could be so? Read this. That's all I have today. I will surely be making a part 2 because lord knows I have more than 3 shows. We are only a few days into a new year and I cannot help but sit and think of what annoyed me last year and hope that somehow I see less of those things this year. 1) Selfies- Even the word 'selfie' makes me stabby. First off... when did humans decide that everyone on their friend list, every follower, family, in-real-life friends, etc wanted to see nothing but their face? Have you looked around outside lately? The world around us may have problems but it's still pretty beautiful. We just got through the busiest 'family time' of the year. All over the country, families and friends were gathering to celebrate the holidays and eat... a lot. Yet I swear I saw more 'selfies' than family photos. 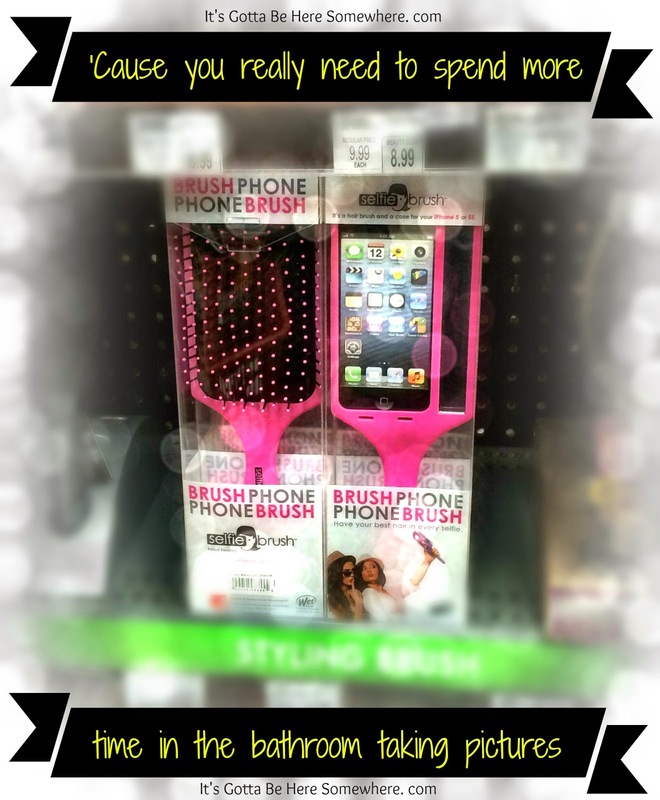 At times, I wondered if some people threw a celebration for themselves and their smartphone. Really.... never saw a single family member's face... just feet or an elbow in the background. This is so, so sad. What makes it worse is that most people take 10 or more pics at a time to get that ONE pic to post that makes them look a little bit more attractive. I know people that take nothing but 'selfies' and it's funny to see them in person.... they look nothing like their bazillion photos on Instagram. It's all a sham. And honestly, if I go to an Instagram account and see mostly selfies, that's a 'do not follow this person'. I want to see the world through the eyes of others... not constantly see the eyes of others. 2) Activia commercials: You know, I don't care about your irregularity. I don't care about what happens to your tummy or bowels once you eat a fattening meal. 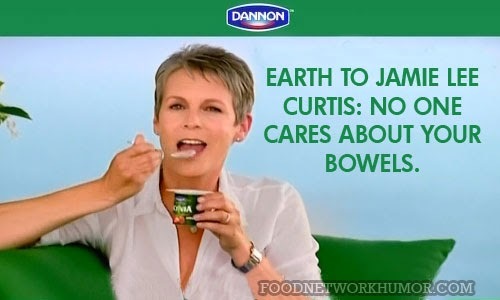 From what I've heard from people that have tried it, it only works for certain people with certain issues.. On the plus side, at least Jamie Lee Curtis isn't in the commercials anymore. I couldn't stand her smarmy attitude anymore. 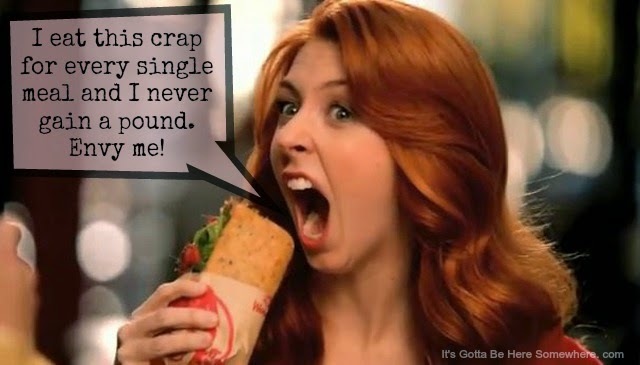 3) Wendy's commercials: Is it me or is that red-headed chick pretty fraking smarmy, too? How does this girl have ANY friends? She constantly makes her friends feel stupid and seems to revel in the fact that she has a better lunch. Then again, maybe she has a problem KEEPING friends. Each commercial features her... with a different group. Yeah, I'd kick her to the curb, too. And don't even get me started on the SINGING commercials; terrible singing and awful lyrics. Yuk. Maybe I'm biased anyway... not a fan of their food. I will take a Frosty, though. 4) Jeggings: Dear God, make it stop. Have you seen the newest ones? Genie Slim Jeggings? Who they heck are they people fooling? "Get great fashion and style at a fraction of the cost of designer skinny jeans" Great fashion? According to.... the millions of women in the country that REFUSE to buy something this awful? I understand that designer jeans aren't cheap but come on... sometimes you get what you pay for. And the last I checked, designer jeans don't look like their trying to make their way up to your neck to wring it. No one will be fooled by these. Yup, this is just part 1. Depending on my mood in the next few days, there could be many other parts to this post. For now... I have only one planned. Until then.... take pictures of the world, not yourself. I hope you all celebrated wonderfully and got home safely. So we found some neon plates and cups that reacted under the black lights and used glow paint from Spencer's to add a glow to the plastic trays and punch bowl we found at Party City. For the food, we went totally low-key. I made crescent pinwheels and mini chicken salad sandwiches for the 'main course'. We also had veggies: broccoli, baby carrots, and cherry tomatoes with veggie dip. (Yes, tomatoes are a fruit but for culinary reference and the dip they go with, they're veggies.) We also had strawberries and grapes with the best fruit dip in the world. And just to bring back great memories from being a kid, we had punch. Rainbow sherbet and Sprite mixed in a punch bowl. I love that stuff! It's been so long since I had it last. The base is Blackout from Rica. I used all of the neon cremes from the Pipe Dream Polish 'A Night in Vegas' collection. For the finishing, I used Glisten and Glow HK Girl Top Coat. Doing splatter paint manicures is a lot of fun but it's messy as hell. Hopefully when I get my nail mail Friday, the mess on my hands will be a lot easier to deal with. I do have a picture of the mess under a black light and I'll get there in just a second. But first, the mani above under a black light! How freaking cool is that? The colors look so different when they glow! It's interesting to see what actually glows under a black light. The polish on the far left? Glisten and Glow HK Girl Top Coat. None of my other top coats glowed like that! It took me only a second after the last bit of clean-up to realize that it looked like I made my own nebula. It makes me want to take glow paint and take it outside and really do some splattering and make some art. Hahaha. Look right above the blog watermark in that photo, right above the 'Gotta Be Here'... is it just me or does that look like a heart with an arrow through it? That was from me cleaning off my clean-up brush in between fingers. Total accident but it looks cool, right? I know I've not been posting a lot lately. Sadly, I've had a medical excuse. For over a year now, my left wrist sometimes gives me problems. I have a brace I use when it does and normally wearing it a few hours helps make the pain stop. I don't know if it's carpal tunnel, tendinitis, or something else entirely. A couple of weeks ago, I uploaded hundreds of photos for the jewelry shop and edited all of them... in one sitting. I think the computer work irritated my wrist too much. I was in PAIN. I wore the brace for 4 days and never felt relief. It was fine as long as I didn't bend it forward or backward, which really limits your activities. I took a long break from the computer and as of yesterday, the pain started going away. Today, it feels fine. And yes, I'll get it looked at soon. I have an appointment with the doc next week. I'm not taking any chances with my wrist and have it get to where I can barely use it. I'll try to post more and I have some ideas for new nail art. And once my nail mail gets here, I should be able to get right on the new manicures.